In order to connect Lhasa to Chengdu, track laying is underway on the Lhasa-Nyingchi part of the existing Sichuan-Tibet Railway. However rational such development may seem in economic terms, communities in the Tibet region and Xinjiang Uyghur Autonomous Region (XUAR) still lack proper respect for their communal cultural practises by the Chinese Communist Party. Surely the project will reinforce Chinese control over these marginalised indigenous communities, allowing for authorities to further sinicize the already-marginalised minorities in Tibet. Work on the new rail line to Tibet – one of the most difficult in the world to build because of the altitude and terrain – is proceeding as engineers and laborers brave the cold and race against time. Track-laying has already started on the Yarlung Zangbo River bridge on the Lhasa-Nyingchi section of the Sichuan-Tibet Railway in Tibet’s Gonggar County. Workers and engineers with the state-owned China Railway Construction Corp are braving the cold and racing against time to finish all the work on the section before the snow and the Himalayan cold currents make their job impossible. 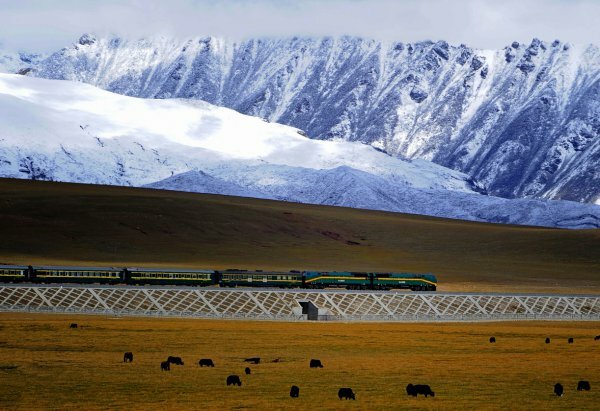 The new rail artery on top of the existing Qinghai-Tibet Railway will link Lhasa to Chengdu, the capital of Sichuan province some three kilometers lower in altitude in a basin east of the Tibetan Plateau. Beijing has earmarked the new project, as well as future lines to connect Lhasa with Kunming and Ürümqi, the capitals of Yunnan province and the Xinjiang Uygur Autonomous Region respectively, in a bid to open up an economic backwater and cement its control of the region with better connectivity. A fully electrified heavy rail link, the Sichuan-Tibet Railway will have to cut through the swamps, rugged gorges and mountains that lie between the two cities, with an elevation difference of more than 3,000 meters. Purpose-built trains with pressurized pure oxygen outlets throughout the passenger compartments will ply the route to the alpine region at a speed of 100 km/h. Chinese engineers face many challenges, ranging from permafrost and sandstorms to mountain forests, but they can draw on their experience from building the impressive 2,000-kilometer Qinghai-Tibet railway, which was opened in 2006. The new line will run for 1,629 km and is expected to cost a whopping 105 billion yuan (US$15.2 billion). Construction started from both ends in 2014 and trains will be streaking from the Sichuan Basin to the Roof of the World at 160 km/h by 2025. Because of its elevation and difficult terrain, Tibet was the last provincial-level region to gain a rail system.